The India Pakistan cricket series left a foul taste in the mouth. Like all Indian dialects, my mother-tongue Konkani – an amalgam of coastal languages and regional colloquialisms – has its share of adages. Kulyari marlyari daant padta? is one. Roughly translated, it means: Will your tooth fall out if I slap your bottom? It’s the standard operating putdown with which irate mothers pack off malingering boys – who cite unconnected causes while feigning outlandish illnesses – to school. You can bet your last dollar Shoaib Akhtar’s mother isn’t fluent in Konkani. Else, the Pakistani bowler would be similarly castigated for what he did – or rather, didn’t do – on the second afternoon of the final Rawalpindi Test in the recently-concluded Indo-Pak cricket series. It was a moment dripping with delicious expectation. India’s much-touted batting was at its most vulnerable after Akhtar, in an inspired spell, dismissed both Sachin Tendulkar and V.V.S.Laxman in the span of a few balls. Pakistan was right back into this so-far one-sided match. The cricketing world now waited to see him rip through the rest of the Indian batting. But in the very next over, Akhtar missed a stride in his follow-through and tilted over, recovering his balance quickly after his left hand cushioned the fall. And then, the real drama unfolds. The fall, though far from heavy, must have hurt. Akhtar wrings his hand, gesturing for first-aid. The physio arrives, tapes his left wrist, and all seems to be well and back on track. Or is it? After a brief chat with skipper Inzamam-ul-Haq, Akhtar walks off the field. Yes – just like that! There is disbelief all around. His team-mates are bemused, the spectators stunned. Television commentators recall instances of injured players turning around seemingly hopeless matches – a very similar case being that of the late Malcolm Marshall, right-arm fast like Akhtar, who once bowled West Indies to a memorable victory with a broken left-hand finger. The TV cameras next show Akhtar feet-up in the dressing room, talking into a cell phone. Pakistani fans look on helplessly as the bowler stays off the field that entire afternoon, then sits out the next morning as well. 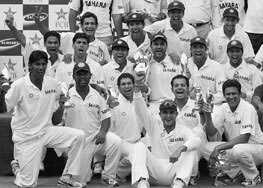 The Indians meanwhile not only escape from jail, in a manner of speaking, but also go on to win the match by an innings, and the Test series 2-1! That post-script from Khan – “if he has one” – is a damning after-thought, a classic sting-in-the-tail! Eager to dispel the widespread notion that there was something fishy in the way Akhtar behaved at a crucial stage of the Rawalpindi Test, PCB constituted a four-member medical panel to examine five Pakistaniºcricketers who sat out the match. This was meant to give the impression that Akhtar wasn’t the witch-hunt’s sole target. On his part, Akhtar complained to the panel that, besides the bruised left wrist, a back strain and an injured 11th rib had also prevented him from bowling in that test. The medical panel, sadly bereft of bottom-slapping Konkani mothers, opined with official blandness that the injuries were “inconclusive” – which, in medical or other terms, is neither here nor there. Shoaib maintained that his injuries had healed, and PCB meekly let bygones be bygones. After all, the immediate purpose had been served: the PCB was seen to have investigated the matter. As crafty administrators will tell you, appoint a committee to insulate yourself against public criticism. And if the committee’s findings are inconclusive, all the better. The establishment boat continues to sail unrocked. Against this backdrop of nationalistic frenzy, the International Cricket Council’s statement on the match-fixing rumors during the Indo-Pak series must have wafted like soft ghazal music into PCB’s ears. Emphasizing the role of ICC’s Anti-Corruption and Security Unit (ACSU) in dealing with any malpractice, Speed sought to assure cricket fans that “every game in this series has been closely examined” and that the ACSU was “alert to the dangers posed by the amount of betting that is taking place on these matches.” He made it more than clear that ICC would not take match-fixing charges seriously unless the allegers produced evidence to support their claims. Why was Speed in such a great rush to issue what is in effect a denial of sorts midway through the tour? His remarks were prompted by comments by former Pakistani captain and whistle-blower on match-fixing, Rashid Latif, who pronounced that he smelled a rat at the fourth ODI at Lahore, and said so on television. “Even a common man could observe that the players were acting on a script because the body language of the players was not as it should have been,” Latif is reported to have commented on the local Indus television channel. Old crusty reporters know that when an official denies anything, it’s a good time to begin probing it. But how many Indian or Pakistani mediapersons raised any questions about the ICC statement? Not one. That’s how powerful the big-money nexus in international cricket has become. And how thoroughly the media have been convinced/coopted/intimidated/browbeaten into believing that it’s squeaky clean on the match-fixing front. Ponder for a moment the actual statement. Could the ICC list the broad parameters of its “comprehensive program,” which led Speed to make the confident assertion that there was no hanky panky in the series? No, we’re not looking for details which might give away sleuthing clues and thus jeopardize future probes. At the same time, if the ICC thinks the public will swallow that ACSU officials lurking around close-circuit TVs in dressing-rooms and “managing” mobile phones being used in there is enough safeguard against match fixing, Speed and his men are better advised to devise another whitewash to clear the entire series of any wrongdoing. Matchfixing crooks have surely wisened up to these comic-strip tactics a long time ago. Even more distressing is the facile manner in which some columnists and officials have concluded from Speed’s statement that there was no match-fixing during the series. You don’t need the superlative skills of a logician to pull the rug from under such a conclusion. It’s one thing to report that the ICC found no evidence of match-fixing during the series – something we are liable to accept in good faith coming, as it does, from the highest authority in international cricket. But it’s definitely quite another quantum leap of faith – and quite ludicrous at that – to infer therefrom that there was no match-fixing at all! The latter inference presumes that ICC knew absolutely everything there was to know about the entire matter, and that it had – to mix sporting metaphors – all the bases covered. Quite simply, this is impracticable in real life. To have a couple of officials lurk in the dressing rooms during a match is to scratch the skin when the disease has crept deep into the bone. Imagine the enormity of the task, if taken seriously. It means that ICC should be tailing more than 50 individuals (including the teams, their support staff, and various officials) at least for the six-week-long one-day and test series, and not just during the matches but between them as well. It also means that ICC has screened all phone-calls – mobile and landline – received or made by these individuals, and all the conversations they had in private with associates, relatives, and friends. Phew! Players routinely get hurt during matches or training and are forced to sit out games. But it’s a measure of the pervading lack of trust in modern cricketers – particularly those from the subcontinent – that the PCB itself felt queasy about Shoaib Akhtar’s withdrawal. Part of this mistrust can be attributed to the fact that most cricketers tainted by the match-fixing scandals have been of Indian or Pakistani origin. Would a New Zealander or an Englishman sitting out with a similar injury cause such a furor? Would their cricket boards fret about whom the bowler was talking to on his cell phone after the injury incident? The PCB, by the way, didn’t have to wait very long to find out. Former Pakistani wicket-keeper and captain Rashid Latif confirmed in a media interview the same evening that Akhtar had phoned him to complain about the field-settings the bowler got from his present captain Inzamam-ul-Haq. PCB then exposed its own hypocrisy and double-standards. It sought to use Latif’s comments as ammunition to nail Akhtar for insubordination. Blithely forgetting that it was the same Latif whom it had discredited and dismissed as a frustrated mischief-monger just two weeks earlier when he had raised doubts that the fourth Indo-Pak ODI in Lahore was fixed. For people who followed the game in person and on television, there was a pall of suspicion about the series from the very start. Indian sportswriters covering the game found the city thick with rumors long before the first ball was bowled. Cabbies and rickshaw-walas who drove them to Gaddafi Stadium were emphatic that India would win. Why? Because if Pakistan won, the best-of-five series – with the hosts 2-1 ahead – would be effectively drained of viewer interest, with the last game reduced to an inconsequential formality. Forget the hoi polloi, even some government officials were predicting that Pakistan would lose the final series game as well. Their rationale? More than an act of courtesy, the Pakistan government was keen to ensure that the Indians returned home victorious: India’s loss could have led to the Indian public demanding an end to Indo-Pak cricket. And keeping cricket tours going was top priority for both governments. The on-field events in the fourth ODI did little to dispel the rumors. After scoring a more-than-decent 293 for 9, Pakistan had India on the mat at 162 for 5 with the last recognized batting pair of Rahul Dravid and Mohammad Kaif struggling at the crease. You’d expect any team to reach for the jugular. Instead, inexplicable things happened. Already guilty of conceding several wides and no-balls, the Pak bowlers suddenly lost steam. Shoaib Akhtar – yes, the same gentleman – showed no signs of the fire with which he’d earlier charged at the Indian batsmen. His captain Haq set a baffling field packing the on-side, while Dravid and Kaif played effortlessly into the huge off-side gaps to cruise home with five overs to spare. Witness a fleeting moment late in that same game, a strange sequence of events which went largely unreported. With India needing 60-odd runs for victory, leg-spinner Shahid Afridi bowls a googly to Kaif. The batsman plays and misses, and is hit on the pads plumb in front of the wicket. Both bowler and wicket-keeper spring up in appeal for a seemingly justified leg-before-wicket dismissal, and – for a heart-stopping moment for Indian supporters – Pakistani umpire Asad Rauf’s finger begins to rise instinctively from midriff to chest. And then it freezes midway and slowly returns to its original position. Not out, he says. And what does the firebrand Afridi do? Nothing. He walks back to bowl the next ball as if nothing happened. Surprise, surprise! Of all people, an on-field brat like Shahid Afridi meekly accepts a most questionable decision without a murmur of protest or disappointment. Was the “Friendship Series” carried too far? It’s a mockery of the game to play it in forcibly sanitized conditions. One would rather have some good, honest, competitive cricket and never mind the occasional jagged or impolite edge to the proceedings. Afridi’s response – or lack thereof – as well as the umpire’s quirky behavior so flummoxed TV commentator Sanjay Manjrekar that the normally-lowkey analyst blurted out his astonishment. In an atmosphere heavy with suspicion already, these events, perhaps entirely innocent, were bound to raise a few eyebrows in the stands. However, not only did the sports press choose to ignore this bizarre, almost surreal incident, a few Indian cricket columnists instead heaped ridicule on those who wondered what had happened. The cascading speculation regarding match-fixing at Lahore, according to one columnist, was nothing but the product of demented minds obsessed with conspiracy theories, the figment of wink-wink, nudge-nudge imaginations. One could legitimately argue that Pakistan’s underwhelming bowling display in the fourth ODI does not in itself constitute evidence of anything inappropriate. But to reject the speculation outright as a figment of demented or brainless minds is surely a dangerous knee-jerk reaction. It was precisely such a reaction that led Justice Chandrachud’s one-man inquiry committee to exonerate several Indian cricketers of match-fixing charges during the peak of the scandal in 1998. The same cricketers were implicated in the King Commission inquiry two years later and then quietly eased out of cricket! The details of the commission inquiry also established that betting is much more sophisticated than simply winning or losing. Every aspect of the game – the weather, the toss, individual scores and wickets, and even every ball – is grist for the punter’s mill. To be sure, for all the rumor and threadbare analyses of plays, hard irrefutable proof of match fixing would be difficult to produce in any event. By their very nature, underworld deals are negotiated and sealed in cloak-and-dagger secrecy. They aren’t drafted on government-approved stamp papers and endorsed by a notary public. But one can’t help posing the mother of all questions: Have ICC and its country boards eradicated the match-fixing menace? Highly doubtful. More significantly, they have failed to convince the public that the menace is in check. Note the near-empty stands during the three Test matches after the packed stadiums for the five One-Dayers. That television coverage caused this slump in attendance is but a limp and partial argument – the One-Dayers, after all, received the same coverage. And remember, Pakistan was hosting an Indo-Pak cricket series after more than 14 years!º The Pakistani crowds were seemingly voting with their feet. It’s time the ICC accepts it has a credibility problem. It’s also time for ICC to bring in an agency like Interpol to nab the culprits. The threat of professional detectives tailing them and monitoring their activities worldwide would at least curb the fixers, and thus help dampen the rumors. How many more series will be played under the sickening pall of suspicion and mistrust? Sure there are people – like those columnists and officials – who vehemently deny it happens at all and therefore appear to know a lot more about match-fixing than the rest of us. Hmm…might not be such a brainless idea to round up these wise men for some serious questioning.